"Sustainable Development and Inclusive Growth in 21st Century: Possibilities and Challenges for India"
Dr. Sam Pitroda, Adviser to the Prime Minister of India on Public Information Infrastructure and Innovations delivered the 3rd Subir Raha memorial lecture, organised by Global Compact Network at New Delhi, on the theme ‘Sustainable Development and Inclusive Growth in 21st Century: Possibilities and Challenges for India’. Mr. Sudhir Vasudeva, ONGC, CMD and President, Global Compact Network India, Ms. Lise Grande, UN Resident Coordinator and UNDP Resident Representative in India and several eminent and senior corporate executives, media persons and students were present at the event. 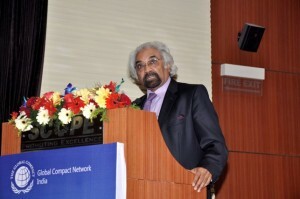 Dr. Sam Pitroda, an internationally respected development thinker, policy maker, telecom inventor and entrepreneur, has been credited for having laid the foundation of India´s technology and telecommunications revolution in the 1980s. He has served previously as the Chairman of India’s National Knowledge Commission (2005-2009). A man wearing multiple hats, Dr. Pitroda, currently is the Adviser to the Prime Minister of India on Public Information Infrastructure and Innovations, Chairman of the National Innovation Council, Chairman of the Smart Grid Task Force set up under the aegis of the Ministry of Power, Government of India and one of the founding Commissioners of the United Nations Broadband Commission for Digital Development. He holds close to 100 worldwide patents and has published and lectured widely across the world. In his lecture, Dr. Pitroda recalled his meetings with Mr. Raha and reading about his life and his achievements. In his lecture about Sustainable development and Inclusive Growth, Dr. Pitroda iterated that everyone wants more consumption, more cars, is a classical example, and ideally, US model based on consumption is not scalable, sustainable, desirable, and workable and as a result, it has far reaching implications on the sustainability in the 21st century. He therefore opined that the key for us is to really create models of development, which are very Indian, sustainable and meets the need of 21st century for India. He stressed that through innovations the dream for a sustainable development process and sustainable future could be realized.